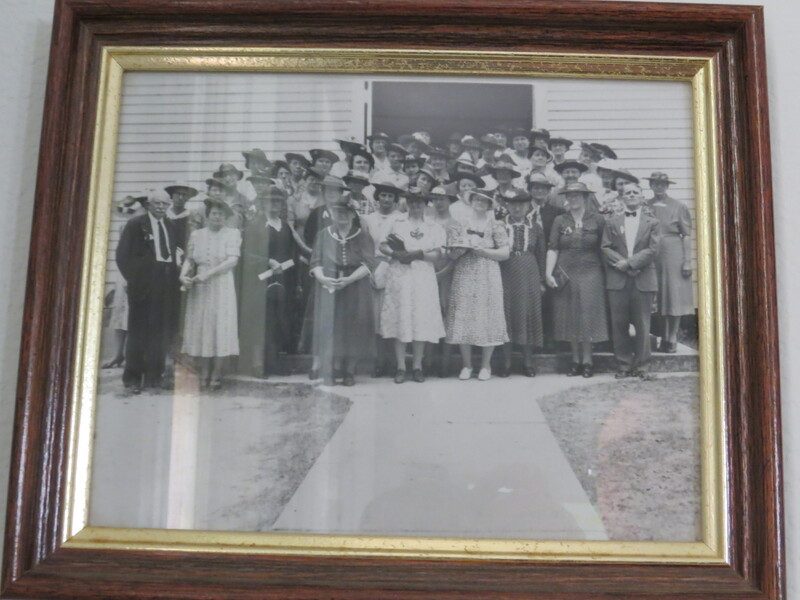 This past Sunday, June 1, 2014, we celebrated the 100th Anniversary of the MLLC Ladies Aid. Here is the history which was prepared as part of the celebration. 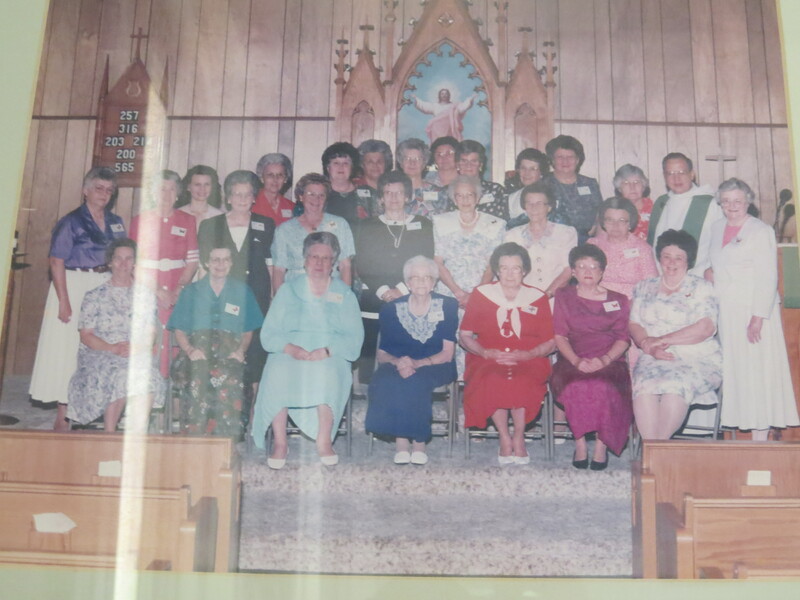 Note the photo above of the members of Ladies Aid who were available to for the celebration at worship this past weekend. 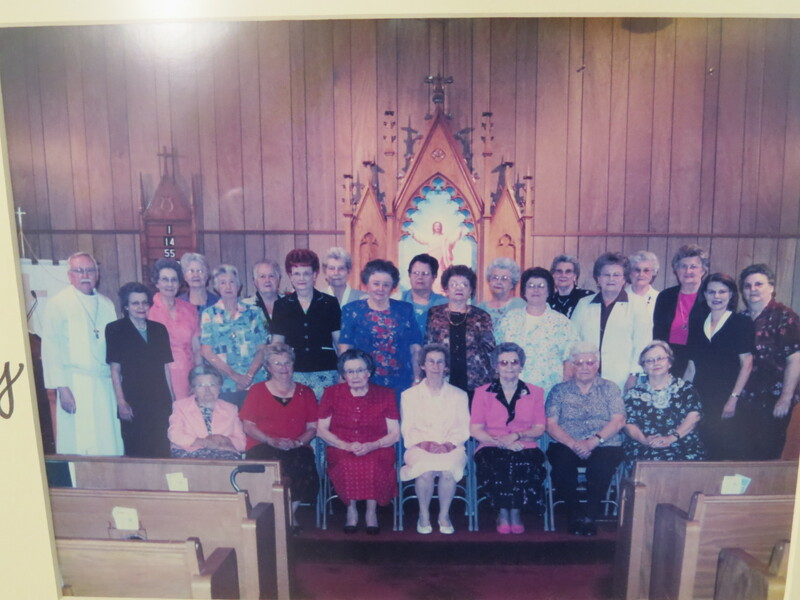 History of the Ladies Aid of Martin Luther Lutheran Church of Carmine, Texas. On June 1, 1914, Pentecost Monday, seventeen ladies met at the Martin Luther Lutheran Church in Carmine to organize a Ladies Aid. Pastor John Harder, the MLLC pastor at the time, helped to adopt a constitution and elect officers. The first officers were: President, Bertha Eisenhauer Umland; Secretary, Selma Hackemack Hoppe; and Treasurer, Leonie Rummel Weyand. 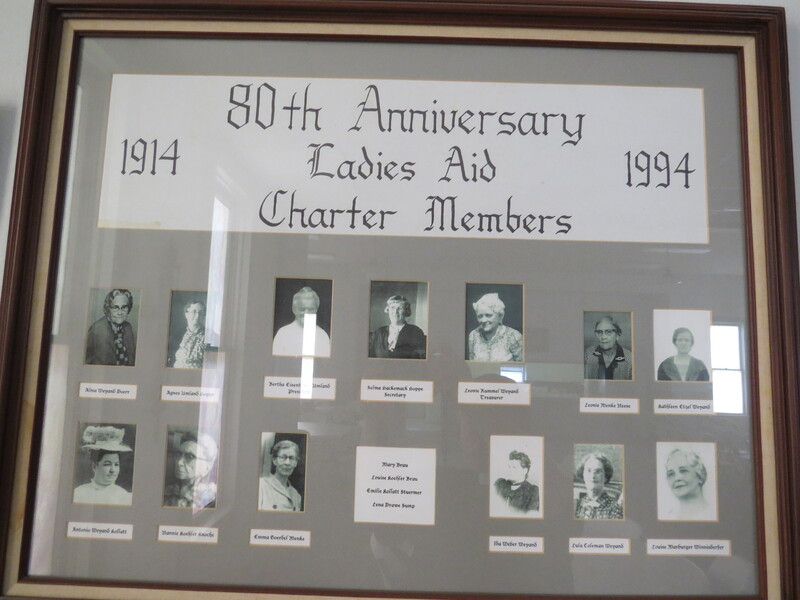 Other charter members were: Mary Brau, Alma Weyand Doerr, Agnes Umland Hoppe, Antonio Weyand Kollatt, Nannie Koehler Knoche, Louise Koehler Brau, Emma Goerdel Menke, Leonie Menke Neese, Emilie Kollatt Stuermer, Lena Drawe Sump, Kathleen Etzel Weyand, Ida Weber Weyand, Lula Coleman Weyand, and Louise Marburger Winnisderfer. Many of the earlier members of Martin Luther were descendants of German immigrants. They, and their descendants, still spoke the German language in the home and in most of their daily affairs. The church records were handwritten in the German script. The Ladies Aid records were also written in the German language in the earlier days. The Ladies Aid was known as the Frauenverein [Women’s Organization]. In the early years of the organization, meetings were conducted in German. Tradition was that women of the Ladies Aid would sing a song in German at the funeral of a member. As a way of contributing to the projects of the church, the first Bazaar was held in March of 1936. The purpose was to raise money for the church and Sunday School. The women made beautiful articles of linens, aprons, bonnets, hand-crocheted doilies, and embroidered scarves for sale at the Bazaar. Plenty of cakes, pies, sandwiches, etc. were donated by the members of the Ladies Aid. The food was not sold, but one could make a donation in a glass placed on the tables. Ladies from local and surrounding churches came for an afternoon of fellowship. This was an annual event at Martin Luther for over twenty years. Today, the Ladies Aid continues to support the different projects of MLLC as well as local and other projects of the ELCA. The Ladies Aid has observed the 25th in 1939, the 50th in 1964, the 60th in 1974, the 80th in 1994 and the 90th in 2004. Members were recognized at each anniversary for their years of membership. 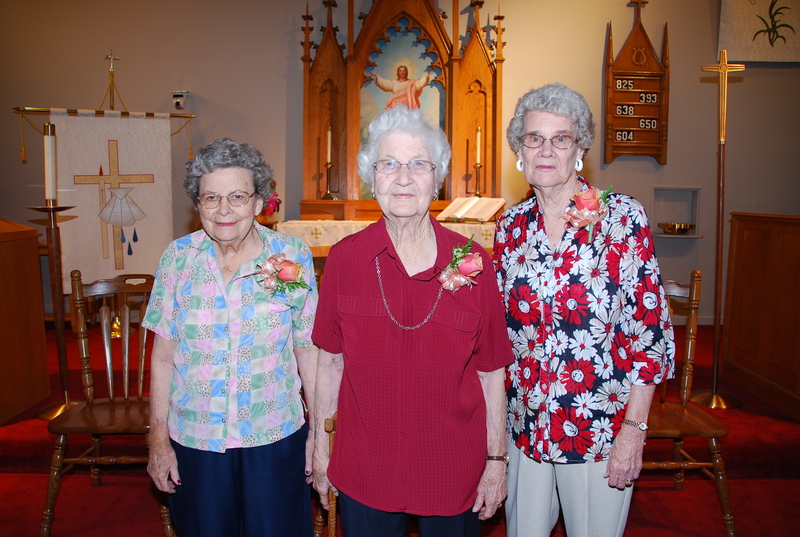 Today, on our 100th anniversary of the Ladies Aid we recognize three ladies who have been members for 60 years or longer: LeVerne Hinze (63 yrs. ); Elvira Dallmeyer (62 yrs. ); and Ora Lee Levien (60 yrs) – see photo below. The two oldest living members today are Bernice Loewe (92) and Elvira Dallmeyer (90). Throughout the years the church organizations have changed, but the Ladies Aid has always maintained its basic structure and name. Today, the women’s groups are called “Women of the Evangelical Lutheran Church in America”. 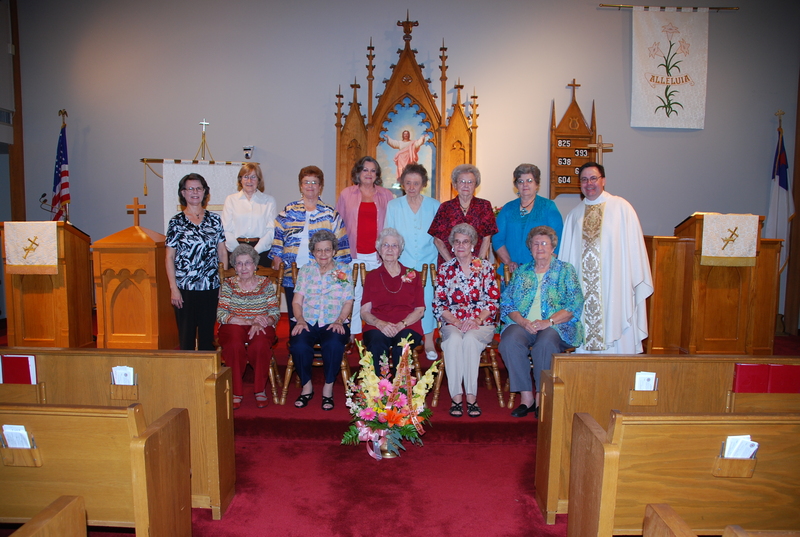 Martin Luther Lutheran has two bible study groups: the Ladies Aid and the Mary Group. Today, the Ladies Aid has 23 members. The present officers are: Susan Ray, president; Shirley Mueller, vice-president; Carol Carmean, secretary; Nancy Eilers, treasurer; Mission officers: Nancy Eilers, community; and Dianne Sager, Action. On this day in 2014, the Ladies Aid asks God to increase in them the spirit of faith and love to help make them worthy of their heritage. “Wir Beten an unseren Vater den Herrn, durch Jesua Christus, sein Sohn.” Translation: We pray this through your son, Jesus Christ, our Lord. These photos are on permanent display in the Fellowship Hall at MLLC.